::: Off the Radar :::: Oliver (Miami Debut), Cassian, Beni + at (786)/Purdy Wednesday (3/21) for FREE!! 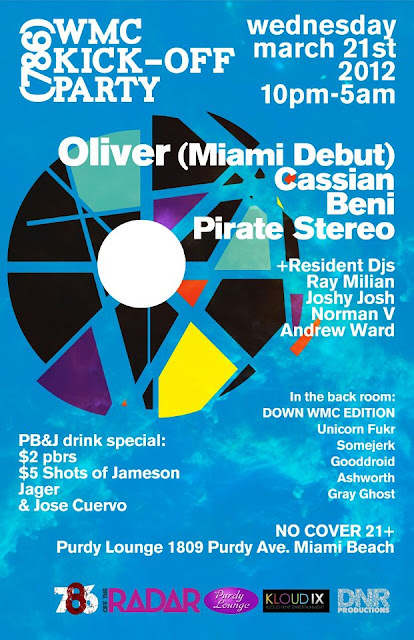 Oliver (Miami Debut), Cassian, Beni + at (786)/Purdy Wednesday (3/21) for FREE!! In addition to our Tensnake Single Release Party with Simian Mobile Disco, Danny Daze, No Artificial Colours + going on Wednesday, March 21st at Gavanna check out the Facebook invite here, we are also gonna be having a very special intimate FREE show going on at our beloved weekly event (786) at Purdy Lounge. It's gonna be Oliver in their Miami Debut, Cassian, Beni, Pirate Stereo and more! Check out that Facebook invite here. I see a lot of jumping around going on this night, which is what typically happens during WMC/MMW. I recommend checking out the Tensnake/Simian Mobile Disco event first then hoping over the causeway to check out this great Free event at Purdy.